I understand that during my participation in Godwit Days field trips, I may be exposed to a variety of hazards and risks, foreseen or unforeseen, which are inherent in each trip and cannot be eliminated without destroying the unique character of the outing. These inherent risks include, but are not limited to, the dangers of serious personal injury, property damage, and death (“Injuries and Damages”) from exposure to the hazards of travel and Godwit Days has not tried to contradict or minimize my understanding of these risks. I know that Injuries and Damages can occur by natural causes or activities of other persons, animals, trip members, trip leaders or third parties, either as a result of negligence or because of other reasons. I understand that risks of such Injuries and Damages are involved in outdoor field trips and I appreciate that I may have to exercise extra care for my own person and for others around me in the face of such hazards. I further understand that on the Godwit Days field trips there may not be rescue or medical facilities or expertise necessary to deal with the Injuries and Damages to which I may be exposed. I have read any rules and conditions applicable to the field trips made available to me; and I acknowledge my participation is at the discretion of the trip leader. 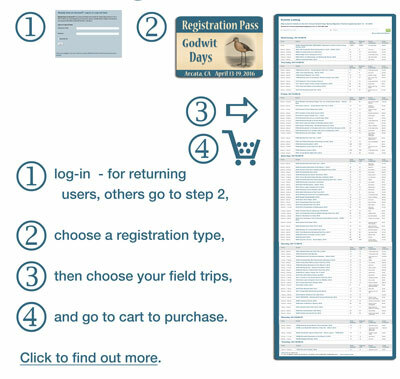 The field trips officially begin and end at the location(s) designated by Godwit Days. The field trips do not include carpooling, transportation, or transit to and from the trip site, and I am personally responsible for all risks associated with this travel. This does not apply to transportation provided by Godwit Days during the field trips. If I decide to leave early and not to complete the field trip as planned, I assume all risks inherent in my decision to leave and waive all liability against Godwit Days arising from that decision. Likewise, if the leader has concluded the field trip, and I decide to go forward without the leader, I assume all risks inherent in my decision to go forward and waive all liability against Godwit Days arising from that decision. To the fullest extent allowed by law, I agree to WAIVE, DISCHARGE CLAIMS, AND RELEASE FROM LIABILITY Godwit Days, its officers, directors, agents, and leaders from any and all liability on account of, or in any way resulting from Injuries and Damages, even if caused by negligence of Godwit Days, its officers, directors, agents, and leaders, in any way connected with the Godwit Days field trips. I further agree to HOLD HARMLESS Godwit Days, its officers, directors, agents, and leaders from any claims, damages, injuries or losses caused by my own negligence while a trip participant. I understand and intend that this assumption of risk and release is binding upon my heirs, executors, administrators and assigns, and includes any minors accompanying me on the field trips. I have read this document in its entirety and I freely and voluntarily assume all risks of such Injuries and Damages and notwithstanding such risks, I agree to participate in the Godwit Days field trips. (By checking the box on the website you are agreeing to these terms.) This form may also be presented for signature at events or Registration. *If you are a minor (under age 18), your parent or legal guardian must sign this Agreement on your behalf. I, the parent or guardian of the minor named below, agree and consent to the foregoing Agreement and give my permission for him/her to go on the Godwit Days field trips. I further consent and allow the trip leader or bearer of this document to administer first aid and/or secure medical attention for the minor as the trip leader or document bearer deems proper. I understand that efforts will be made to contact me if medical treatment should be needed. I will ensure that the minor will bring any necessary medications with him/her on the trip.